“Me and Earl and the Dying Girl” (2015). Cast: Thomas Mann, RJ Cyler, Olivia Cooke, Nick Offerman, Connie Britton, Molly Shannon, Jon Bernthal, Katherine C. Hughes, Matt Bennett, Masam Holden, Bobb’e J. Thompson, Gavin Dietz, Edward DeBruce III. Director: Alfonso Gomez-Rejon. Screenplay: Jesse Andrews. Book: Jesse Andrews, Me and Earl and the Dying Girl. Web site. Trailer. 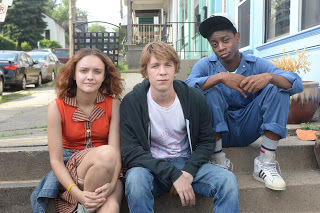 Three young friends (from left), Rachel (Olivia Cooke), Greg (Thomas Mann) and Earl (RJ Cyler), face circumstances that force them to grow up faster than expected in the engaging new comedy-drama, “Me and Earl and the Dying Girl.” Photo courtesy of Fox Searchlight Pictures. Greg’s teenage ennui troubles those who care about him, most notably his hip, tattoo-clad history teacher, Mr. McCarthy (Jon Bernthal), and his loving but kooky parents (Connie Britton, Nick Offerman). They look for ways to shake Greg out of his adolescent funk, most of which have little impact. But that all begins to change when Greg’s mom asks a favor destined to set him on a new path. When Greg’s mom learns from her friend Denise (Molly Shannon) that her daughter Rachel (Olivia Cooke) has been diagnosed with leukemia, she asks Greg to spend some time with her to lift her spirits. Greg initially balks at the idea, claiming that he barely knows Rachel and has no clue how to cheer her up. But mom has confidence in her son, and, thanks to her gentle persuasion, she eventually coaxes him into paying Rachel a visit. Greg Gaines (Thomas Mann, left), a high school senior lacking direction, purpose and connection in life, receives an interesting suggestion from his loving but kooky parents (Nick Offerman, center, Connie Britton, right) in “Me and Earl and the Dying Girl.” Photo courtesy of Fox Searchlight Pictures. The initial meeting between Greg and Rachel is strained, to say the least. However, when Rachel learns about Greg and Earl’s film projects, she’s intrigued. In fact, their silly little movies are one of the few things that make her laugh in the face of her circumstances. Before long, Greg and Rachel, with Earl in tow, become the best of friends. What’s more, Greg slowly begins to find himself and his place in the world. But, as Rachel’s condition worsens, the strength of that bond and of Greg’s emerging sense of self-awareness get seriously tested. With Rachel’s illness progressing, her health and spirits deteriorate. The same can be said of Greg’s academic standing; while spending more of his time trying to lift Rachel’s mood, he lets his schoolwork lapse. Offering Rachel encouragement increasingly drains him of ideas, too. But, just when he seems to be fresh out of ways to cheer her up, one of Rachel’s friends, Madison (Katherine C. Hughes), comes up with a proposal that draws on one of Greg’s strengths: She suggests that he and Earl make one of their movies just for Rachel. The challenge of creating a suitable film for someone in Rachel’s condition is understandably trying. That difficulty is compounded by Greg’s conflicted, questioning state of mind. The strain of these circumstances soon becomes apparent, affecting Greg’s attempts to understand it all, not to mention the nature of his relationships with Rachel, with Earl and, most of all, with himself. Being asked to grow up faster than expected seems patently unfair, both for those witnessing it, as well as those living through it. That’s certainly the case for Rachel and Greg, as well as those who care about them. But, under those dire conditions, how we respond is what truly matters most. Denise Kushner (Molly Shannon), the boozy single mother of a daughter diagnosed with leukemia, struggles to cope with her circumstances in the engaging new comedy-drama, “Me and Earl and the Dying Girl.” Photo courtesy of Fox Searchlight Pictures. Under such circumstances, our responses depend on our beliefs, thoughts and intents, the basis of the conscious creation process, which serves to frame the reality we ultimately experience. These powerful forces determine what we draw into our existence to address these (and all of the other) conditions of life. And, given that, one would hope that we choose those beliefs carefully, for they will be faithfully reflected in what materializes around us. This is the law of attraction at work in its most basic expression. The scenarios that Rachel and Greg have manifested are by no means enviable and certainly full of challenges, but they also offer powerful opportunities for personal growth and life lessons. The protagonists serve as mirrors for one another, too, as they move through their respective ordeals. For example, when the story begins, Greg seems to have all but given up on himself and his future. But, when he befriends Rachel, he finds a purpose. So, when Rachel’s condition begins to slide and she questions the value of continuing her treatment, she seems to give up, something that raises Greg’s ire and represents a complete turnaround from where he began. In her own way, Rachel thus provides the inspiration her friend needs to make something of his life. 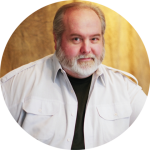 Witnessing such circumstances is undoubtedly painful, but it’s something Greg needed to experience to get his existence back on track. When Greg Gaines (Thomas Mann, right) is faced with a dearth of ideas on how to cheer up his ill friend, Rachel (Olivia Cooke, left), he receives an interesting proposal from her friend, Madison (Katherine C. Hughes, center), in “Me and Earl and the Dying Girl.” Photo courtesy of Fox Searchlight Pictures. Perhaps most importantly, though, manifestations like these enable us to face our fears, a crucial aspect of our continued personal growth. It doesn’t really matter that we may even be afraid of these circumstances as we approach them; what matters most is that we form and embrace beliefs to muster up the courage to do so, thereby affording ourselves an opportunity to move through whatever is holding us back in furthering our personal progress. It also allows us to overcome the pitfalls of practices like wishful thinking, which ultimately provide false comfort and can delay (or even derail) our efforts at growing as fully realized beings. After all, if we’re unable to face our fears in getting through life, how might we ever do so to get through death? “Me and Earl and the Dying Girl” is excellent all the way around, a young adult story that rises above most typical YA fare, with an intriguing, engaging style reminiscent of films like “(500) Days of Summer”. Its emotive screenplay is deeply affecting, evoking a range of moods and viewer reactions, but without ever resorting to cheap, manipulative sentimentality. The ensemble cast features fine performances across the board, especially among the three young leads and their parental counterparts. You’ll want to keep those hankies handy, too, just in case. Despite the picture’s serious undertone, it provides ample humor, too. 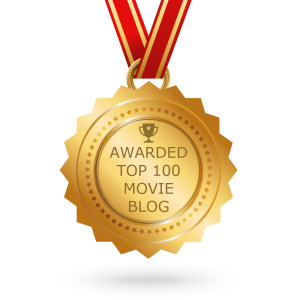 It draws upon a variety of means to get laughs, especially in its clips from Greg and Earl’s classic film parodies. Movie buffs will surely appreciate the hilarious snippets featured from productions like “A Sockwork Orange,” “Senior Citizen Kane,” “My Dinner with Andre the Giant” and “Brew Velvet,” among others. Such humor contributed to the accolades the picture earned earlier this year at the Sundance Film Festival, where it captured the event’s Audience Award and Grand Jury Prize. The quest to fulfill our destiny may be filled with unexpected twists and turns. However, the fulfillment that comes from such a journey may be unattainable by other means, providing us with what we need, even when that outcome doesn’t seem likely. Trusting in ourselves and the reality we create will get us where we need to go, be it in matters of both life and death. And, if that doesn’t make our existence worthwhile in the end, I don’t know what would.